Joel started Kyokushin Karate at the age of 15 in his native Quebec. His love of Kyokushin brought him to Australia in 2001 where he completed one year as a full time student and was awarded his Shodan by Sensei Garry O'Neill after he successfully completed a 40 man kumite.Joel then continued his training back in Quebec under Sensei Christian Oulette and Shihan Andre Gilbert where he both instructed and competed. 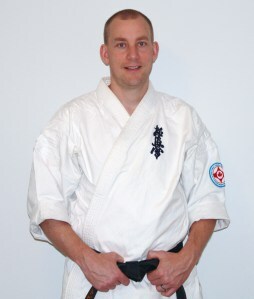 In 2003 Joel represented Canada in the 8th World Open Karate Tournament. After the World Tournament Joel moved to Abbotsford BC and trained under Sensei Tatsuji Nakamura in Richmond where he won the 2003 Canadian Open.In 2006 Joel became a Police Officer and was posted to Chilliwack BC with his wife Sarah, and two children. In July 2012 Joel was posted to the Division Training Section as a Use of Force Instructor. With the new position he now has the ability to fulfill his dream of opening a dojo in the City of Chilliwack.